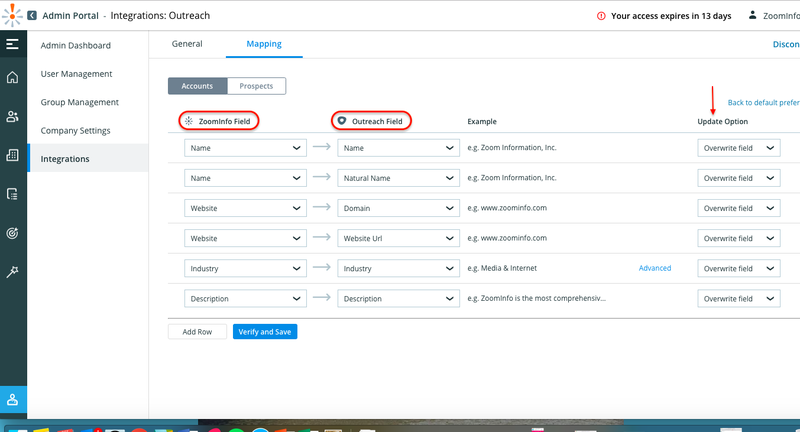 With the Outreach integration, you can push contact and company information directly from ZoomInfo Business Edition or ReachOut into Outreach to take action on. Ready to set the connection up? Follow the instructions below to learn how! Click your name at the top right and select Settings from the drop-down menu. Navigate to the Integrations tab and click Connect under the Outreach tile. A new window will populate, prompting you to sign in with your Outreach credentials. Note: Make sure you have pop-up blockers disabled on your current tab in order to see this window. Congratulations – you’re now connected! 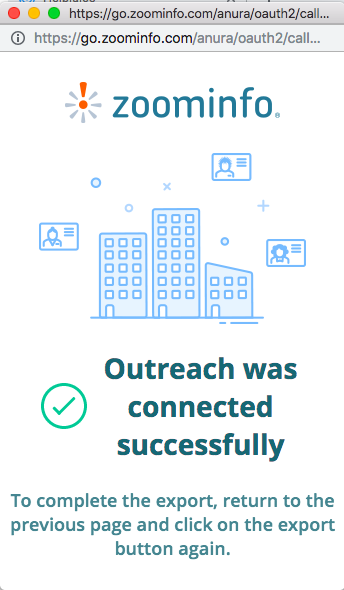 Note: to complete these steps, make sure you've connected to your Outreach environment. If you have not done this yet, follow the connection steps above! 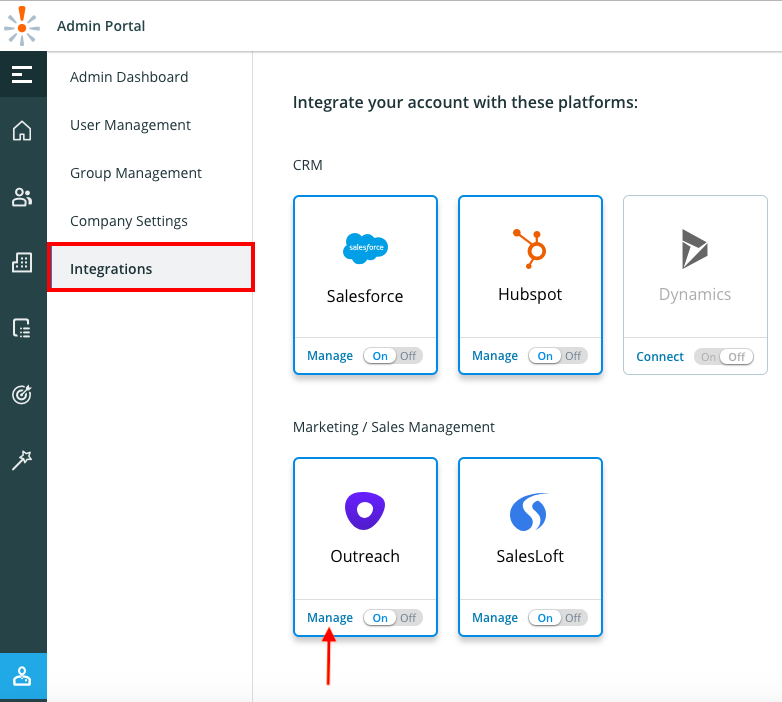 Within Admin Portal: Navigate to the Integrations tab and select 'Manage' under the Outreach tile. Note: these changes are made across all users under your organization's ZoomInfo instance. Within Admin Portal: Navigate to the Integrations page and click Manage under the Outreach tile. Click on the Mapping tab at the top left. Accounts & Prospects must be mapped individually and they can be found directly below the mapping tab. The ZoomInfo fields will be on the left with your external fields listed on the right. For each field, you can choose whether ZoomInfo data overwrites your existing data or only fills in when the information is missing under the Update Option column. Note: Any required fields within your Outreach will be marked with a red asterisk. You can remove any nonrequired fields by clicking the trash icon to the right within that field's row or add additional fields by clicking Add Row at the bottom of the page. After setting the mappings, make sure to click Verify and Save at the bottom of the mapping page for each object. Note: to successfully verify and save, make sure no fields are left blank. If the mappings are correctly set, you'll receive a successful notification at the bottom of the page. If the mappings are not set correctly, you'll receive an error notification informing you which field needs to be adjusted. When users are exporting to Outreach, the Direct Phone will map to the Business Phone, but in the case that a specific contact does not have a Direct Phone then we will send the Company Phone to the Business Phone field.